Thief tries to evade police in foot race before being shot by IDF soldier and critically wounded. An Arab car thief was shot in the parking lot of a branch of the Rami Levy supermarket chain, in the Gush Etzion region of Judea on Wednesday. Detectives from the Hevron region were conducting special operations against car thefts in the are, particularly focusing on the supermarket's parking lot as it has been hit frequently. They found two suspects trying to steal a car and arrested them. One of the suspects was apprehended, and a foot chase commenced to grab the second suspect. Police report that during the chase an IDF soldier shot at the suspect and critically wounded him. Police have clarified that the incident is of a criminal, and not a nationalistic or terrorist, background. Last month a 16-year-old Arab terrorist stabbed two Jewish shoppers at a Rami Levy branch in Mishor Adumim to the east of Jerusalem. Apparently he was aided by an Arab employee of the store who gave him the knife he used to moderately wound the two. 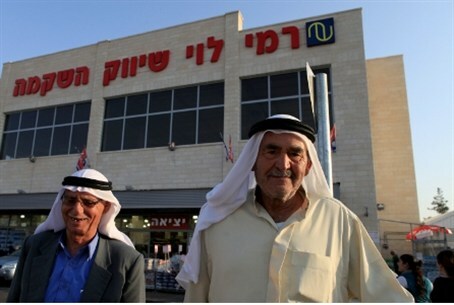 The incident led to angry protests demanding that Rami Levy stop hiring Arab workers, given the security threat they potentially pose.